Mug can be a noun or a verb, with completely different meanings. 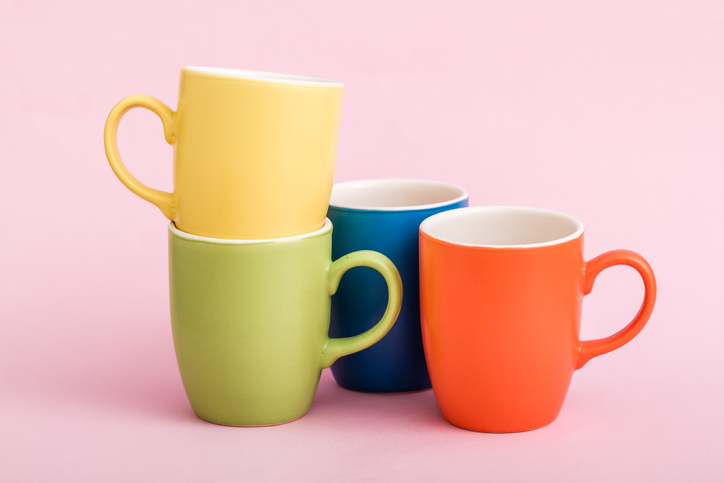 As a noun, mug is a large cup used for beverages, or the amount contained in it. In everyday language, it can also be used to refer to someone’s face and is often preceded by the word ugly. As a verb, mug means to attack and rob someone in public, or to make strange expressions with your face. In UK English, a mug is also a stupid or easily fooled person. The girl came down the stairs, holding a huge mug of hot chocolate in her tiny hands. I'm so mad at him! I don't want to see his ugly mug ever again. After being mugged, Mary was afraid to go out alone after dark. You want me to pay £10,000 for that old car? You must think I'm a mug. Mug, meaning ‘a cup used for drinking,’ dates back to the mid-16th century. Its origin is uncertain, but some linguists have suggested that it came from the Low German mokke or mukke (mug), though the origin before then is unknown. Others think it may have come from a Scandinavian source, making it related to the Swedish mugg (mug or jug) and the Norwegian mugge (an open container for warm drinks, or a pitcher), possibly also related to the Low German. The sense ‘a person’s face’ was first used in the early 18th century, possibly because of the intricately carved mugs shaped like grotesque faces, and the sense ‘a portrait for police records’ appeared in the late 19th century (they later became photographs). The expression mug shot comes from this sense, and has been used since the 1950s. Mug, colloquially meaning ‘a foolish or stupid person,’ dates back to the mid-19th century, and originated in thieves’ slang. Mug, meaning ‘to beat up,’ has been used since the early 19th century, when it specifically meant ‘to hit in the face,’ and comes from the noun sense meaning face. This sense expanded to “attack” more generally by the mid-19th century, and then ‘to attack and rob’ by the late 19th century.